Our systems are funny creations. Given a perfectly healthy output signal of about 2 Volts, say, from a CD-player, we squash and attenuate it in a preamp to a level much lower, only to boost it again with a factor of 30 in the power amplifier, from where it is fed at 10V or so, and that is pretty damn loud already, to the speakers. That squashing bit can't be sound, so small wonder then that a preamplifier can make or break (brake?) the music. And no wonder at all then that the device responsible for attenuating the precious signal has to be seen as the core element of the preamp. Carbon-track or plastic-track potentiometers are commonplace, but can't be ideal. Solid-state switched resistor networks must be harmful too, given the rather non-linear properties of their semiconductor base material (although the WM####) looks promising). Ideally we want just a couple of resistors to do the job. That is, one couple for each gain setting. Not quite practical, even though I know of some audio types who do just that: for each setting they plug a different attenuator in-between source and power amplifier. A bunch of resistors and a bunch of switches then. Ah, finally getting there: the switched resistive attenuator. Perhaps the best-known commercially available of this particular breed is the DACT. 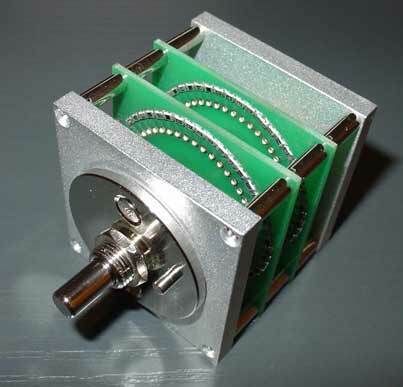 Similar to the Acoustic Dimension it is a series attenuator, and it uses SMD resistors. But the DACT has 24 steps, where the AD boasts a 41 position control. That is quite a difference, as such a 41-step volume control is bound to let you come closer to the desired replay levels, whereas a control with a limited number of positions may most of the time sound either too loud or too soft. Finding a 41-position switch is not easy, and I suspect then that the Acoustic Dimension is a fully proprietary design. This unit is very sturdily built and looks sensibly put together, even though I wonder if it really has to be this big: 45 x 45 x 53 mm, or 75 mm long including the shaft, which has a whopping 5.8mm diameter! (BTW, AD assured me that, indeed, the thing had to be that big, and that for the intended market of tube preamps this is not seen as a problem). 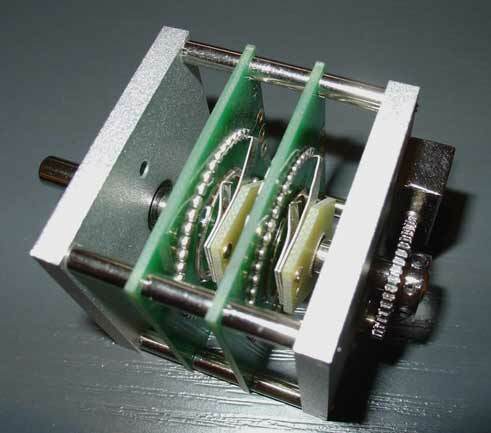 AD make several versions of this attenuator, 10k or 100k mono or stereo, and a number of more exotic 600 Ohm T-types and balanced H-types. The one submitted for test was, of course, the stereo 100k one, clocking in at over 120 euro. All of these use silver contacts and non-magnetic resistors. How do you test a volume control, especially one that, erm, voluminous? My regular linestage consists of a Panasonic For-Audio 100k stereo pot, followed by a classical Jung-pair of AD744 opamp and LM6181 current-feedback opamp, DC-coupled, not even a servo. As it happens, the preamp breadboard I use in the voltage regulator series (##link), also has this Jung stage, preceded with an Alps Blue 50k pot. One of the voltage regulator classes in this open-frame preamp can be configured to be the same as in my lounge pre, so all I had to do was to swap the Alps for the AD to get a direct comparison, switching almost in real-time! The listening started with some sort of calibration: the Alps-pre sounding pretty close to the Panasonic-pre, bar it being slightly darker in tone and less specific in imaging. Substituting then the AD stepped attenuator for the Alps marked the start of the real test. Even though my Panasonic pot has a claimed channel balance spec of <0.5dB, I always had the feeling that the right channel in my system sounds a little bit busier, perhaps even louder than the left. Well, with the switched attenuator in the system the image was rock-solid centered, wider than the Panasonic, seemingly flatter, but a lot more stable and more delineated. Comparing longer revealed that the Panasonic's seemingly deeper stage was created by it sounding somewhat dirtier and sloppier than the very clean AD, and that after having grown accustomed to the AD it allowed me simply to hear that much deeper into the mix. So then, revealing it is, but clinical it, luckily, is not, its midrange and treble being entirely smooth and sweet, yet detailed and incisive. In use the AD was almost as nice as a stepless potmeter, with a satisfying 'click' when switching it, and it was always easy to find the right listening volume. This is a big volume control, and not really a cheap one either. But its pros far outweigh these cons, namely the almost unprecedented luxury of 41 steps, and of course, its sound quality that is no less than brilliant.